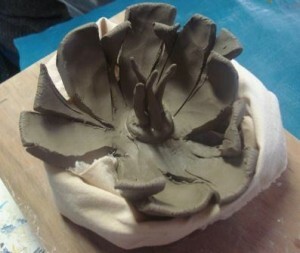 I have been working with Nottingham University on a research project looking into the benefits of working with clay to enhance recovery from mental distress. The main researcher is Elaine Argyle and the workshops are hosted by City Arts. I was introduced to the group as a “potter” which of course means I make pots, which is only partly true. Yes, I sometimes make shapes that are pot -ike and contain things, but I think the definition is too narrow. I have also made heads, flowers, murals, tiles and lamps, none of which are pots. So I like to think of myself more as an “artist” who works in clay, which sounds a touch pretentious and grand. Basically, I just like mucking about with clay for which I like the term “clay wallah”. So there you have it. 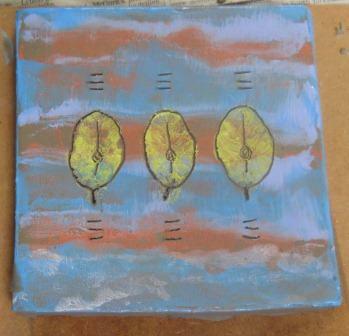 The group thought we would be making pots and yes we did, but we also made flowers and tiles. I generally start with a simple method like a thumb pot or a pinch pot and show how these are only starting points. Yes, pots can be made using this method, but also a variety of other things. So we turned our pinch pots into flowers for the first workshop and made a variety of unique and wonderful flowers. I introduced coloured slip as a way to decorate the work and we ended up with a colourful garden. Each week I introduced another technique and then showed ways in which it could be changed and transformed into something else. 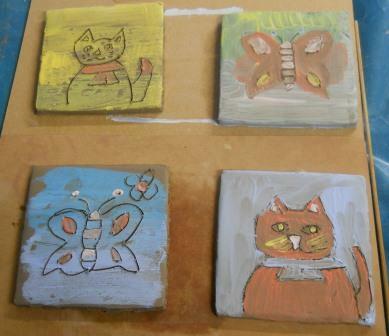 We mono printed onto tiles and drew through the colour to reveal the clay beneath. One week we made bowls of all sizes and textures. The last week I introduced throwing on the wheel, which produced much hilarity and messiness that had a definite clay wallah feel to it. People were mesmerized watching others attempt to center the clay before trying to throw a bowl. I got a lot out of working with such a diverse group of people and seeing the evident enjoyment of everyone during the sessions. There was always a period of quiet when everyone became absorbed in their work. Then the conversation would bubble up again and, hey, it’s time for a break as a couple of hours had whizzed by – time for chocolate biscuits.